↑ "Sagrada Família gets final completion date – 2026 or 2028". The Guardian. 22 September 2011. Retrieved 2011-10-13. ↑ "Unesco, Works of Antoni Gaudí". Whc.unesco.org. Retrieved 7 November 2010. ↑ Drummer, Alexander (23 July 2010). "Pontiff to Proclaim Gaudí's Church a Basilica". ZENIT. Retrieved 7 November 2010. 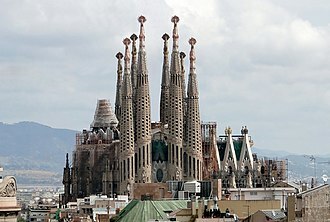 ↑ "The Pope Consecrates The Church Of The Sagrada Familia". Vatican City: Vatican Information Service. 7 November 2010. Archived from the original on 11 November 2010. Retrieved 11 November 2010. ↑ Delaney, Sarah (4 March 2010). "Pope to visit Santiago de Compostela, Barcelona in November". Catholic News Service. Retrieved 7 July 2010. ↑ Gladstone, Valerie (22 August 2004). "ARCHITECTURE: Gaudí's Unfinished Masterpiece Is Virtually Complete". The New York Times. Schneider, Rolf (2004). Manfred Leier, ed. 100 most beautiful cathedrals of the world: A journey through five continents. Trans. from German by Susan Ghanouni and Rae Walter. Edison, New Jersey: Chartwell Books. p. 33. ISBN 978-0-7858-1888-5. Giralt-Miracle, Daniel (2002). Lunwerg, ed. Gaudí, la busqueda de la forma. ISBN 84-7782-724-9.